Cletus was a Roman, and ruled the Church in the time of the Emperors Vespasian and Titus. In accordance with the precept of the Prince of the Apostles he ordained twenty-five priests for the City. 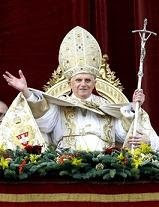 He was the first Pope who made use in his letters of the phrase, Health and Apostolic Benediction. Having brought the Church into an excellent state of order, he was crowned with martyrdom in the reign of the Emperor Domitian, and the second persecution since the time of Nero, and was buried on the Vatican mount, hard by the body of blessed Peter. Marcellinus was a Roman; he ruled the Church during the savage persecution which was ordered by the Emperor Diocletian. He suffered through the false severity of those who blamed him as being too indulgent toward them who had fallen into idolatry, and for this reason also hath been slandered to the effect that he himself burnt incense to idols; but this blessed Pope, on account of his confession of the faith, was put to death along with three other Christians, whose names are Claudius, Cyrinus and Antoninus. Holy Saturday: "Something strange is happening today... a great silence ..."